Drawing used as a frontispiece to New Coterie no. 6 (summer and autumn 1927). 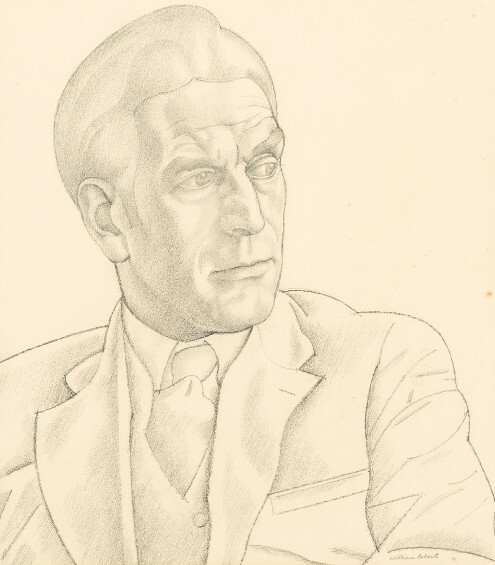 The short-story writer and poet Alfred Edgar Coppard (18781957) was born in Folkestone, the eldest of four children of a tailor and a housemaid. Aged 9, he left school to help provide for his family when his father died, and by the age of 20 he had worked for a street seller of paraffin and firewood, an auctioneer, a cheesemonger, a soap agent and a carrier. After several years in the office of an engineering firm, in 1907 he moved to Oxford as a clerk in an ironworks. He used prize money won as a spare-time athlete to buy books and develop his early taste for reading and study, and on 1 April 1919, with savings of £50, he left his job to become a full-time writer. His first collection of stories, Adam and Eve and Pinch Me, was published in 1921, and many others followed. His stories often present a woman's point of view, and sympathise with the misfit and the underdog faced with the unpredictability of life. Coppard was the uncle of George Coppard, a British soldier who served with the Machine Gun Corps during the First World War and whose 1969 memoir With a Machine Gun to Cambrai inspired WR's On the Wire 1972.